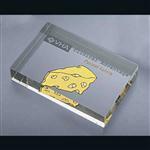 Top quality 3D laser engraved crystal cube with beveled edge and custom with your logo floating inside, and/or a shape of your choice. Employee award, volunteer appreciation, speaker gift, board gift. Packaged in a beautifully lined gift box. 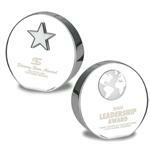 Let our creative team assist you to design the ultimate custom award or paperweight! Add a hard hat, city, apple, cone, dollar sign, or one of hundreds of 3D images to choose from. Email sales@adcomarketing.com for further assistance and ask to see a sample! Production Times Available: Standard 10-15 day production. Available Imprint Options: Add additional outer imprint for $8 per side - please ask for quote. 1.63 lbs/cube, gift box included. Acrylic Paperweight 5" x 3"